At the 2015 Paris classic car auctions, 17 cars sold for over a million dollar including a record $18.6 million for a 1961 Ferrari 250 GT SWB California Spider. The Artcurial auction during the Rétromobile week attracted the most attention with 59 barn-find cars from the Baillon Collection including the record-setting Ferrari California Spider. Artcurial achieved a million dollar on 7 cars. Bonhams achieved a million dollars on five cars with a record best result of $2.2 million for a 1965 Aston Martin DB5 Cabriolet. RM Auctions also sold five cars for more than a million dollar with a best result of $1.85 million for a 1961 Ferrari 250 GT/L. 1930s Alfa Romeos generally struggled to find buyers. Several further cars received highest bids close to the lower estimates and deals may have been concluded after the auctions. Artcurial traditionally have the largest auctions during the Paris classic car sales during Rétromobile week early February. In 2015, Artcurial easily attracted the most attention (and most money) with the 59 barn-find cars from the Baillon Collection. Although these cars were all in rusty condition, all were sold at prices far in excess of the pre-auction estimates. 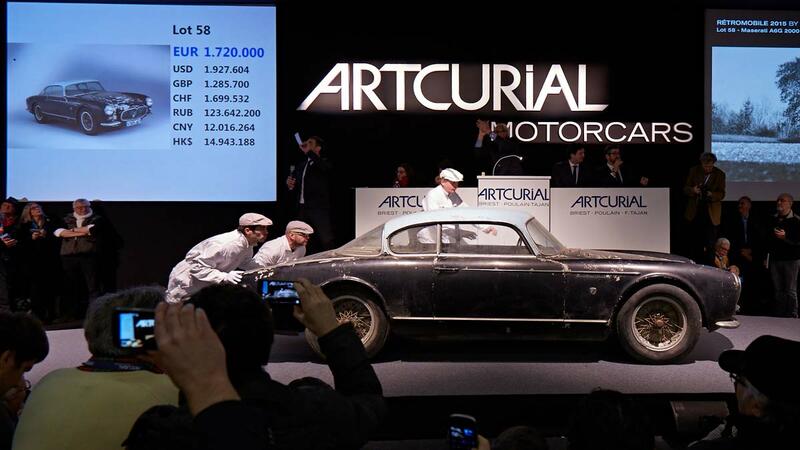 Artcurial’s marathon 11-hour auction over three sessions – automobilia, the Baillon Collection, and classic cars – earned a total of €46 million ($52 million). The Baillon Collection alone contributed €25 million ($28.5 million) with three cars, including the top two result selling for over a million dollars. Artcurial’s sell-through rate was 89% – very high by Paris auction standards. Artcurial took the top three places at the 2015 Paris auctions. Artcurial’s highest unsuccessful bid was also the second highest bid placed at the auctions: €2.6 million for a 1966 Ferrari 275 GTB/2 Long Nose that belonged to amongst others Roger Vadim and Jane Fonda. Bonhams had its fourth Les Grandes Marques du Monde au Grand Palace auction in Paris in 2015. Although only half of the cars expecting to reach a million dollar plus found buyers, Bonhams had its best Paris auction ever and the best total earnings ever for Bonhams at a continental European sale. Bonhams top results were for Aston Martin Cabriolet: €1.9 million for a 1965 DB5 and €1.2 million for a 1962 DB4 – both new model records. RM Auctions had its second classic car sale in Paris in 2015 and earned €19 million ($22 million) with a sell-through rate of 82%. RM Auctions’ top result was €1.6 million for a 1963 Ferrari 250 GT/L. A highest bid of €1.8 million failed to secure the 1939 Alfa Romeo 6C 2500 Sport Berlinetta that was used by Mussolini’s mistress. More than half of the million dollar plus cars at the Paris 2015 classic car auctions were Italian. Only four of these were Ferraris but not surprisingly, the most-expensive car sold was a Ferrari. The 1961 Ferrari 250 GT SWB California Spider from the Baillon Collection sold for €16.3 million ($18,649,760) by Artcurial to set a new model and new Paris auction record. The car is in a remarkably original condition but will need serious money spend to make it presentable again. The 1956 Maserati A6C 2000 Gran Sport by Frua was the second-best result at the auctions. This barn-find from the Baillon Collection also set a new auction record for the model. The 1966 Ferrari 275 GTB and 1963 Ferrari 250 GT/L were in well-maintained but unrestored condition. The 1990 Ferrari F40 in contrast is almost brand new with only 1,200 km on the clock. Four 1930s Alfa Romeos were on offer in Paris but only the 1930 Alfa Romeo 6C 1750 Grand Sport driven by Boris Ivanowski to victory at the 1930 Brooklands Double Twelve found a buyer. The headline offering at RM Auctions – the 1939 Alfa Romeo 6C 2500 Sport Berlinetta that was used by Italian dictator Benito Mussolini’s mistress – failed to sell with a highest bid of €1.8 million just €100,000 below the lower estimate. The Paris auctions are usually good venues to see rare European cars in all categories but in 2015, some of these achieved over a million dollar results. Artcurial achieved double pre-estimate for a 1968 Bizzarrini 5300 GT Strada while RM Auction sold a 1965 Iso Grifo A3/C Stradale for just over a million euro. A rare 1930 Isotta Fraschini 8A SS Cabriolet also sold for just over a million dollar. The highest result for a German car in Paris 2015 was €1.4 million for a 1964 Porsche 904 Carrera GTS at RM Auctions. At the same auction, two Porsche 911s received bids near a million euro but failed to clear the reserves. Rare Porsche 911s are increasingly attracting bids of around a million dollars, which will probably encourage more owners to test the market in coming months. The best result for a Mercedes Benz was €1.4 million for a 1938 Mercedes Benz 380 K Cabriolet A in mint condition at Artcurial. Artcurial also received a highest bid of €1.7 million for a 1939 Mercedes Benz 540 K Spezial Roadster. Two of the three Mercedes Benz 300 SLs on offer sold for over a million dollar but both near the lower estimates. A Gullwing attracted a highest bid of €1.1 million at Artcurial. The only million-dollar result for a French car at the Paris 2015 classic car auctions was for a 1949 Talbot Lago T26 Grand Sport with coachwork by Saoutchik. This rusty car from the Baillon Collection – with a rear-end shunt to boot – sold for €1.7 million. The pre-auction estimate was only €400,000 to 600,000. Three further French cars attracted highest bids in excess of a million euro but failed to sell: a 1935 Delahaye 135 S (RM), a 1928 Bugatti Type 43 Grand Sport (Artcurial) and a 1932 Bugatti Type 55 Cabriolet (Artcurial). Bonhams also sold two Aston Martin cabriolets for more than a million euro each. However, the biggest surprise at the Bonhams auction was probably the just over a million dollar for a 1966 AC Cobra 289 Markt II Roadster – it sold for more than $200,000 over the pre-auction estimate.